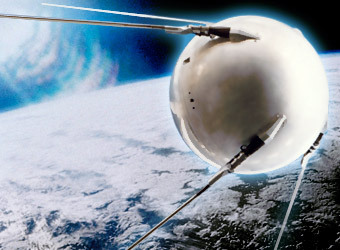 The Space Race began on October 4 1957, when Russia launched Sputnik 1, a 184- pound, highly polished sphere that rose above the earth's atmosphere and went into orbit around the planet. A stunned world listened to the beep-beep-beep of its transmitters, and America was thrown into a struggle to overtake its Cold War antagonist. One year later, the National Aeronautics and Space Administration (NASA) was established under the Eisenhower Administration and the race was on. Schools turned their attention to science, mathematics and engineering, and one achievement after the other finally culminated in the landing on the moon by Neil A. Armstrong and Edwin "Buzz" Aldrin Jr. on July 20, 1969.